The BBC reported that “More than 56 million people have been lifted out of poverty in Latin America and the Caribbean in recent years, according to the United Nations Development Programme (UNDP). While the BBC reported that progress was uneven, a 16% decrease in poverty in 12 years is staggering. When I think of dramatic poverty reduction in recent years, China and India first come to mind. Progress in many African countries also stands out. Yet Latin America’s unheralded improvements are remarkable. Every generation of old people gripes about the youngin’s, how they are lazier today and don’t know how good they got it. Well, when I was a wee whippersnapper, children were not as smart, had worse health, lived shorter lives, were less literate and numerate, lived in a country that had just legalized racial equality but was still hostile to gays. Oh, how I pine for the golden days of yore! In yet another demonstration of progress, researchers find that kids today smoke and drink less. The also don’t do drugs as much (though marijuana use is increasing; more on that below). “Every year, the Monitoring the Future (MTF) survey measures drug, alcohol, and tobacco use and related attitudes among 8th, 10th, and 12th graders.” The MTF is done by the National Institute on Drug Abuse. 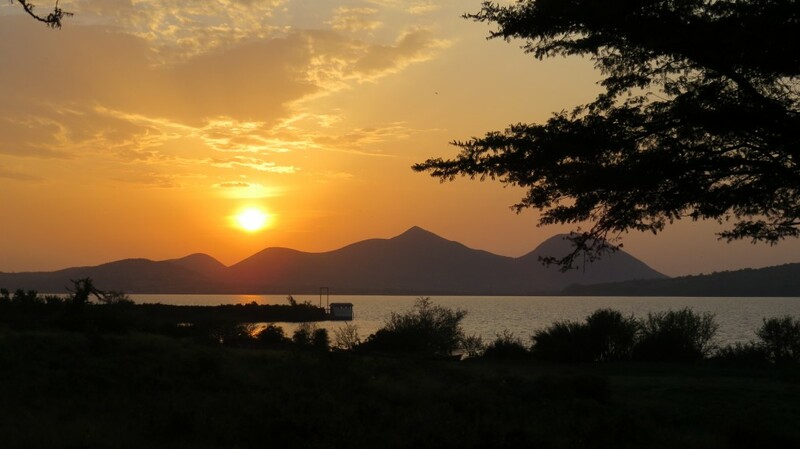 Many of the results of the 2013 MTF were quite heartening. 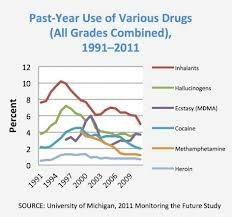 As you can see in the chart below, the trend lines for nearly all drugs are headed downward in the past 20 years. However, the 2013 MTF did note that marijuana use is increasing. This isn’t surprising as marijuana is now legal in some states and will likely be more and more accepted, both by the law and society. Therefore I am not optimistic about future trends in teen marijuana use. Also, the abuse of prescription drugs and over-the-counter medicines is quite troubling. Ironically, it’s the adults that fuel these trends, not our miscreant children. As prescription drug use increases by parents, abuse increases with children stealing these medications for “recreational use.” And the grown-ups in state houses relaxing marijuana laws are a primary cause of teens thinking marijuana is neither harmful–the governor signed the bill into law, right?–or illegal. Nonetheless, historically low levels of tobacco and alcohol use among teens is quite heartening.